It was before the Euro (the franc was trading between 5 and 6 to the dollar), before any other country (Spain, Denmark, Australia) started stealing the city’s thunder. A time when those of us who cared about always went to Paris. I wish I could remember what year these are from. 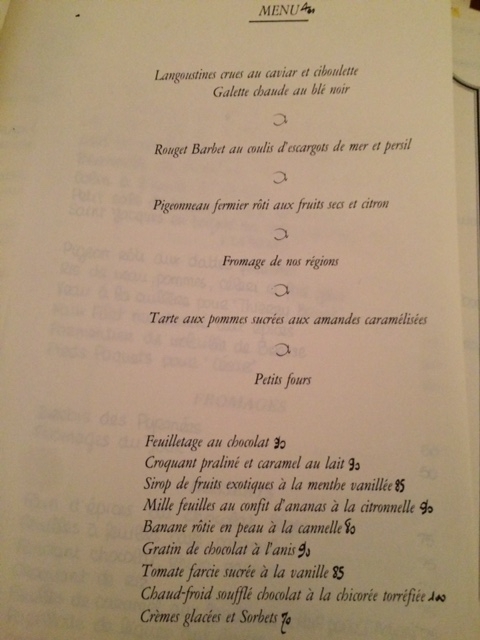 I thought they were from a 1990 visit, but looking at what I wrote about that trip, the food was different. 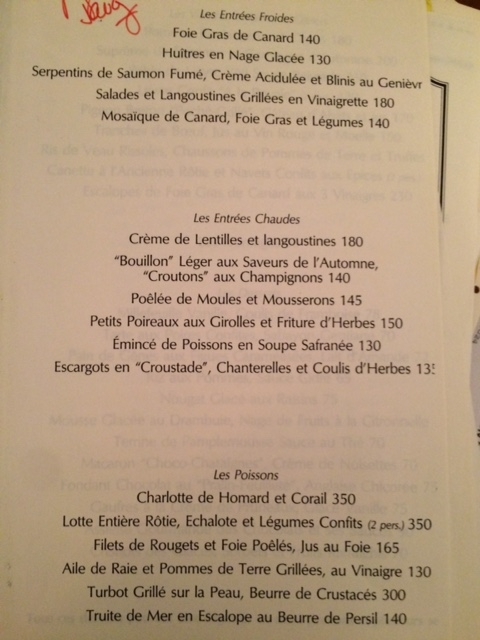 So I’m guessing these menus date from around 1987. Not sure. Joel Robuchon,who was widely considered the best chef in the world, had yet to start trotting around the globe creating his far-flung restaurant empire. His Jamin was an intimate little place, and I remember taking a single bite and thinking: This food was not prepared by human hands. The meal was astonishing in its deliciousness and technical perfection. As for that caviar and cauliflower dish? It may be one of the world’s most imitated recipes. Apicius is a truly gorgeous restaurant set in an estate with a garden in the middle of Paris. 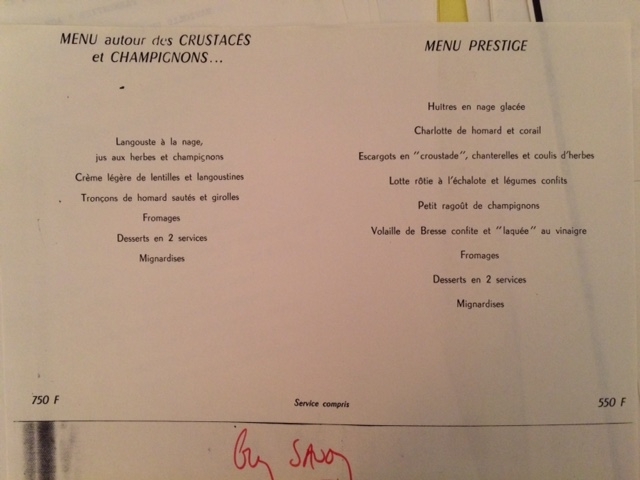 Most astonishing: the chef, Jean-Paul Vigato is still there after all these years! Guy Savoy was still ensconced in his first, less formal restaurant, a rollicking joyful place that seemed less pretentious than any other starred establishment. I fell madly in love with it. And then there was Arpege. 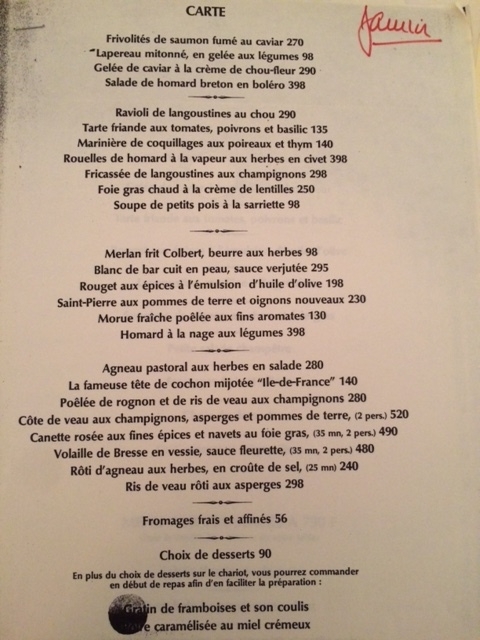 This was long before Alain Passard had his vegetable epiphany, but the meal was so memorable I still can’t be in Paris without longing to stop in for a meal. 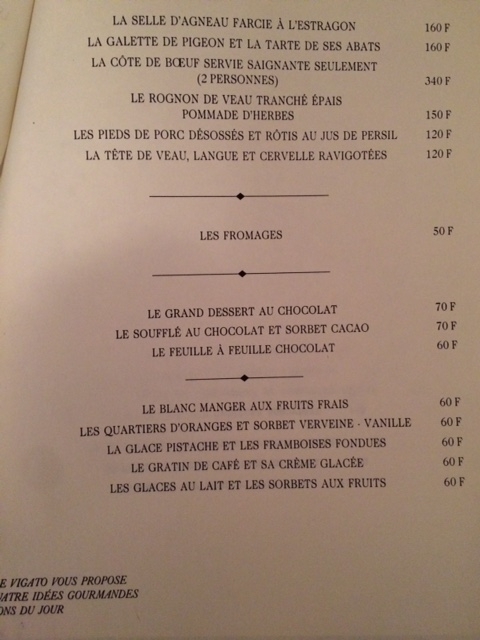 Here’s what I ate last time I was at Arpege. 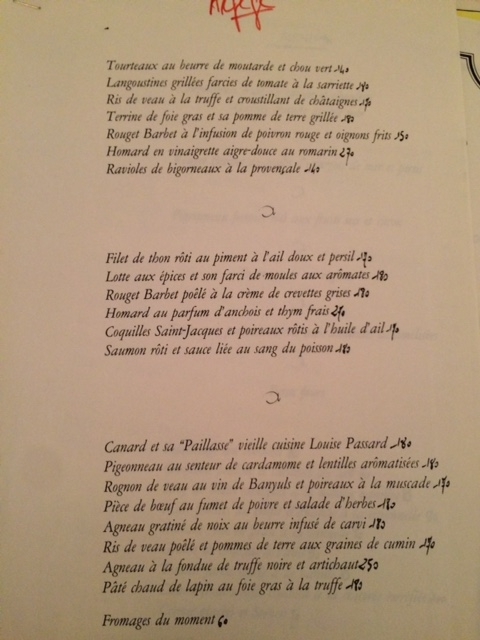 I am visiting Paris at the end of May and looking forward to a meal at Apicius. Thanks for this post. 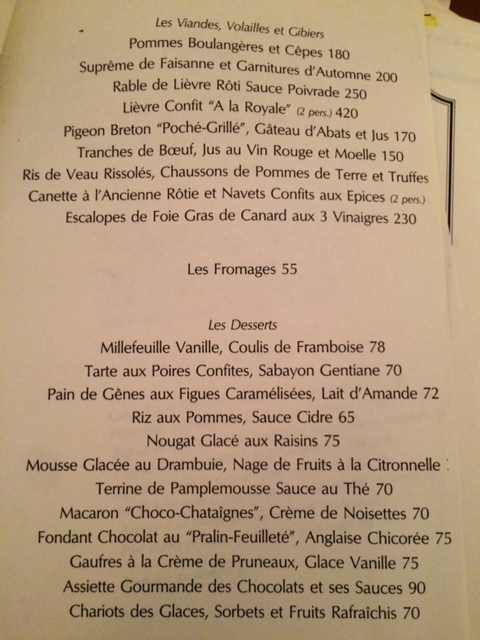 Aside for the drastic shift in Instagram-bait plating, this menu doesn’t look too far off from many solid Parisien bistros of today. That’s another reason to love Paris. Thanks for this lovely post, Ruth! 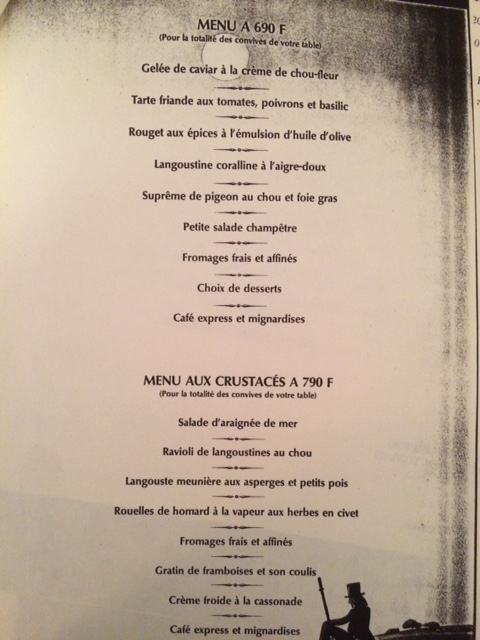 These menus also tell of a time, now largely gone, when you had to ask the restaurant for a copy of the menu. 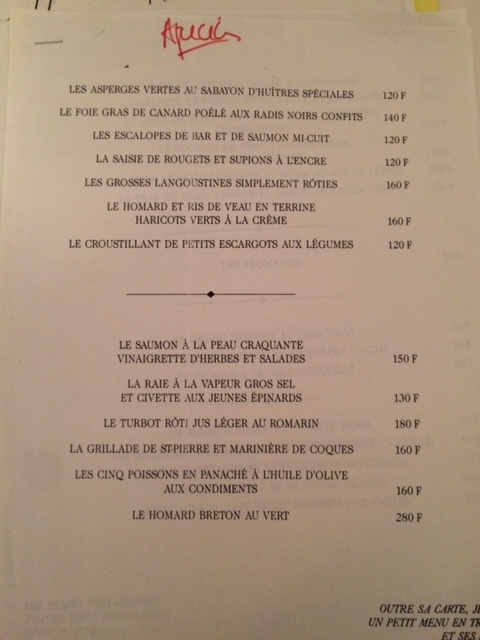 Now of course diners can generally download a copy themselves. Indeed in most cases, the diner knows and has studied the menu, and made their picks, even before showing up. I have been in love with Paris ever since my first visit many years ago. Thank you for this post, it brings back so many good memories . I still love Paris. Thanks so much for a wonderful post although I should never have read it on an empty stomach! Now, all I can think about is delicious French food. I too love Paris and all the way down to the south of France.